A Body in Fukushima is a collaboration between dancer Eiko Otake, photographer Bill Johnston, and the place Fukushima, now an eerie and irradiated landscape. It is part of Eiko’s series A Body in Places. When one sees the photos, one understands why the series takes its name from a body in places, rather than a body dancing, or a body dancing about places. For place has the upper hand here, and it rewrites the meaning of every movement and photographic framing indelibly. Seeing these photos made something amply clear to me, a choreographer who has for many years worked in alternative (and sometimes abandoned) spaces and wandered in the borderlands between representation and realness. I could see in them immediately how to be a body in a place is different than to bring a dance to a place, or even to make a dance in a place. This is not site-specific dance. 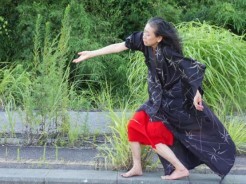 Certainly, the fact of being there, at the abandoned rail stations, beaches, and residential neighborhoods of Fukushima, affects Eiko’s dance. It inspires in the sense that it darkly breathes movement (and non-movement) into her. 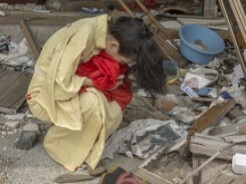 In the photos, I witness her physically processing devastation. But what is important is not the fact that place is an inspiration, an influence, but that it metaphysically changes the status of her actions. What matters is the act itself, the ritual, the pilgrimage of going and dancing there. Fukushima is not a set, a backdrop. It defines the very act that we see in the photos and the artifacts that the photos are. Eiko’s dance is not a dance about Fukushima. It is the articulation of her act of being there. Whether we see it or not, by dancing and photographing, Eiko and Bill change the place and the place changes Eiko and Bill. They process the history of that place and in doing so, become a part of that history, and a part of Fukushima’s much needed healing. We think about bio-remediation, but what other intangible kinds of remediation do violated spaces need? I have danced in arsenals, former morgues, dilapidated factories, contaminated rivers, old sweatshops, and abandoned lots. These spaces need our movement. 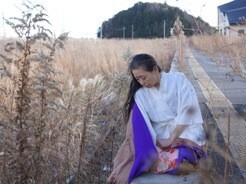 By dancing, Eiko offers a kind of somatic remediation for the earth’s body. By photographing, Bill witnesses and testifies to it. And not only do they affect the site, but the site frighteningly, ill-advisedly, affects them. They too are changed—quite literally—by radiation from the Daiichi Nuclear Plant. And our awareness of that colors all the images. For while the photos are stunningly beautiful, we understand, we feel physically, the real-life risk involved in taking them. For me, this was most palpable in the second set of photos from Momouchi Station. Eiko and Bill returned in July of 2014 to find the same abandoned rail station verdant: Eiko lies on the train tracks, now overgrown with hyperbolically green vines. They are wild and creepily abundant. We know something is awry. Her stillness highlights the unnatural growth. The crystalline detail of Bill’s landscapes does the same. With this image I came to know again what I already knew in some way: that their bravery, their pilgrimage, the gesture of lying on abandoned train tracks, the click of the camera—all this is the dance.